The Mini Glock or Sub Compact G26 is the triumphant advance of the smallest GLOCK pistol, specially developed for concealed carry and previously a domain of 5-round snub nose revolvers. New Gen 3 + Gen 4 G26 also for Sale. Firearms must be shipped via Fedex Overnight, to your selected FFL. This is a flat rate, $40 charge. Yes, you can purchase a Glock handgun on this website and have it shipped to a local FFL dealer in your area. Then, you will need to go to that dealer and fulfill the local and state requirements necessary to own a handgun at which time you can take delivery of the gun. 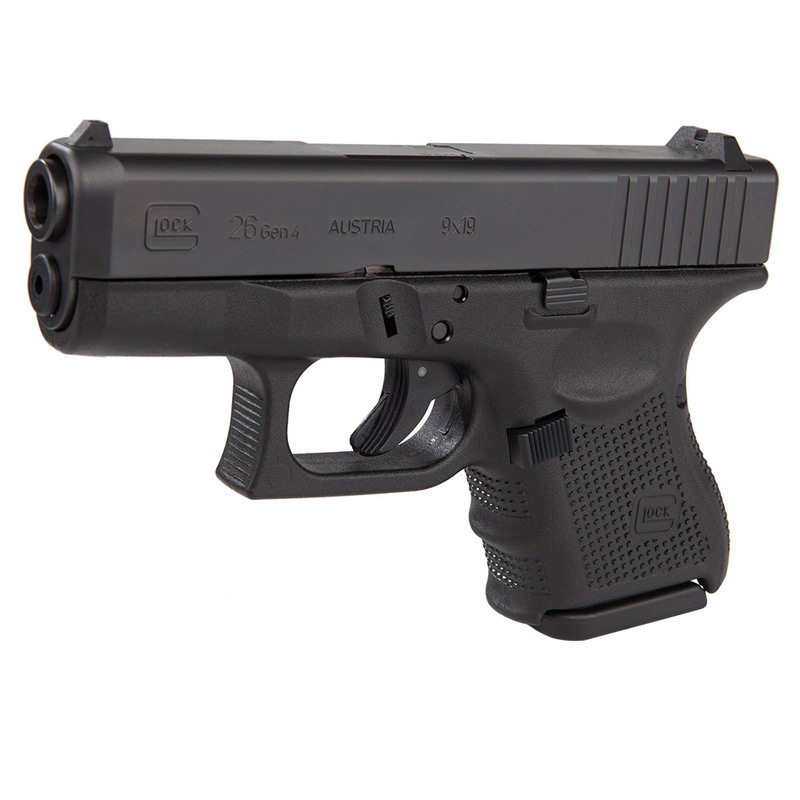 The Mini Glock or Sub Compact G26 is the triumphant advance of the smallest GLOCK pistol, specially developed for concealed carry and previously a domain of 5-round snub nose revolvers. It started with the presentation of the GLOCK 26 in August 1994. The GLOCK 26 offers more than an alternative in this field. The magazine capacity of 10 rounds as standard and the highly accurate firing characteristics explain the worldwide distribution among security personnel and secret services. Gen 4 models come with three 10-round magazines. Gen 4 models cannot be sold into California except to qualified Law Enforcement personnel. We can and will customize and install parts for you at no charge and ship the gun fully assembled and ready to shoot. Just add the parts to your shopping cart and please make a note in the comments section providing us with any details or special requests. Please note: No discounts are available on the purchase of Glock factory handguns. Discounts will only apply to accessories and parts. Firearm orders generally require 24-48 hours for processing prior to shipping. NOTE: FFL required for shipment. If you do not have a dealer in mind we can help you find one in your area. If you do have a dealer selected, you must note which FFL will be receiving this item in the Comment box during checkout. Failure to do so could delay your order processing and shipping. If your FFL is not already on file, have them fax a signed copy of their license to 858-569-0505 and include your name and order number on the cover sheet. i had my Glock 26 gen4 9mm great gun i carry it everyday had no problems THINKING on getting me another Glock . A great CCW gun. Lightweight and gets the job done! I have had my Glock 26 for 10+ years. It is a great gun in every aspect. It is reliable, accurate and hard hitting gun.You can learn to hit almost anything with it at distances up to 30 yards or may be even further. The only upgrade I have done to mine is add mag extension for my pinky, but I still only put 10 rounds in it, 12 seems to be too much for it.